Start Automation Right from the Design Phase for Continuous Testing. Use simple English and intuitive UI to write automated tests 5x faster. No tools and programming knowledge is required to create and execute automated tests. Automated testing made faster than ever using natural language for Web and Mobile applications. Writing Automated tests are as simple as writing manual tests. You can create reusable 'step groups' and use them for multiple test cases throughout your application under test. Testsigma lets you write Selenium and JS based custom functions for your custom requirements. 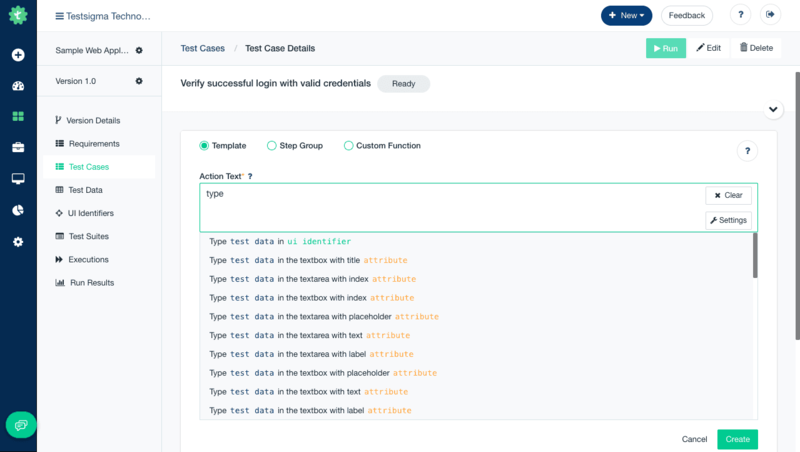 Testsigma also provides you with an option to record your UI actions that we convert to natural language based automated tests cases. A unified platform for both Manual and Automated testing. Use Simple and Intuitive UI to generate test data to run tests with different data sets to maximise coverage and to cover all the boundary conditions. Testsigma also lets you generate test data using a custom function for your custom requirements. Provides an option to import test data in different file formats like XLS and JSON. With Testsigma, Creating and Managing test data is as simple as working with XLS sheets. Testsigma doesn’t mix locators that identify your UI elements with test steps. This will help all your team members access the same object repository while eliminating duplicate efforts. Maintenance of your automated tests for changes made to your application is now better than ever by allowing you to change the locators in a common repository. Testsigma uses Dynamic locator strategy with multiple attributes to identify an element thus making your tests more stable and reliable. Testsigma ensures your tests don’t fail easily even if there is a change in one or more attributes of the element. Create and Manage Test data at Global level to use in all your test cases. Manage a common set of data, centrally in all your tests.